Ocean trace minerals have all the elemental minerals that occur in nature. URGENT - your garden needs Trace Minerals. "Most crops utilize an average of 40 elements from the soil. 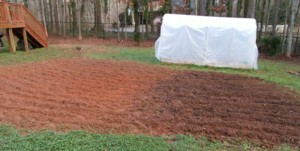 commercial fertilizers add a maximum of six elements." It is really quite simple. We need to replace these missing trace minerals. They are greatly needed by the plant and soil. Without them, we may see increased insect, disease, and weed problems. There are numerous sources of trace minerals. My favorite source is the ocean, where all 90 naturally occurring elements are in liquid form, and in perfect balance. Kelp, ocean fish, and concentrated sea minerals are all good sources of ocean minerals. My first application of concentrated sea minerals showed amazing results. I put it on a portion of grass in my back yard. 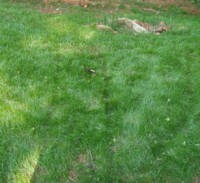 Much to my surprise, within a week the grass had turned a dark green, and really started to grow. My grass had a spot like that. It really stood out. A couple of weeks after I applied the sea minerals, I could hardly find that spot. The whole areawas lush and dark green! In the second picture on the right, the urine spot was formerly just below the center of the picture. GroPal has the greatest density of trace minerals of any fertilizer from the ocean that we know of. It is made by evaporating 100 gallons of pure Australian ocean water down to just 1 gallon. Close to 99% of the sodium and most of the chloride solidify, leaving a liquid that is quite low in sodium but rich in trace minerals. We have added a product called Soil Balance to GroPal, making a new, wonderful product for the soil called GroPal Balance. Applying GroPal Balance A to your soil brings the goodness of GroPal and the soil building capabilities of Soil Balance into one product. Concentrated liquid sea minerals are in ionic form, and are readily available to the plant, especially when fed through the leaf. GroPal Balance C is GroPal with a little bit of Soil Balance added in for superior intake by the plant. See application methods for GroPal Balance here. There are great advantages to getting trace minerals back into the food we eat. To me, the most wonderful of these are that it makes crops so much more nutritious and healthy.The research of Dr. Maynard Murray attests to this. Second, fruits and vegetables taste so much better! Your body craves these nutrients. A friend of mine had been giving squash from his garden to his 80 year old next door neighbor for years. When my friend used some GroPal in his garden and shared his squash with her, she said, "I know squash, and this is the best tasting squash I have ever had." She's not the only one that has noticed this. Healthy vegetable gardening is all about growing nutrient dense foods. My garden is healthier, and I am healthier. This is a win-win proposition! Concentrated sea minerals are sold as a mineral supplement for people. They are in ionic form, and highly available to the body. I use them for sports rehydration.